Plascore’s ability to transform ideas into marketable solutions is evident throughout a diverse product offering, including new Radiant Cooling Panels. Radiant Cooling Panels utilize hydronic technology to lower surrounding air temperature. The result is a more focused, comfortable and cost-effective means of cooling room occupants. Radiant cooling is gaining widespread popularity in Europe and Canada because of its comfort (no direct air flow) and modern efficiency. 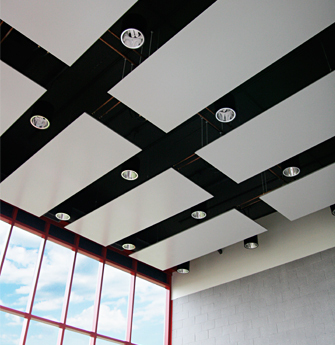 Plascore Radiant Cooling Panels are attractive, designed to suspend from the ceiling directly above a person. Water is piped through a series of tubes, which effectively absorbs heat from warmer surrounding air and transfers the heat out of the building through a geothermal system. Research conducted at Lawrence Berkeley National Laboratory suggests that, on average, radiant panel cooling might save 30% of overall cooling energy for applications across a range of representative climates in North America (Stetiu 1999). What’s more, these economies often occur during periods of peak energy consumption. With growing emphasis on sustainable design, and recent advances in hydronic system designs, Plascore Radiant Cooling Panels can provide significant comfort, appearance and energy consumption advantages over traditional HVAC systems, especially in high performance commercial buildings. Contact your Plascore representative for additional information.